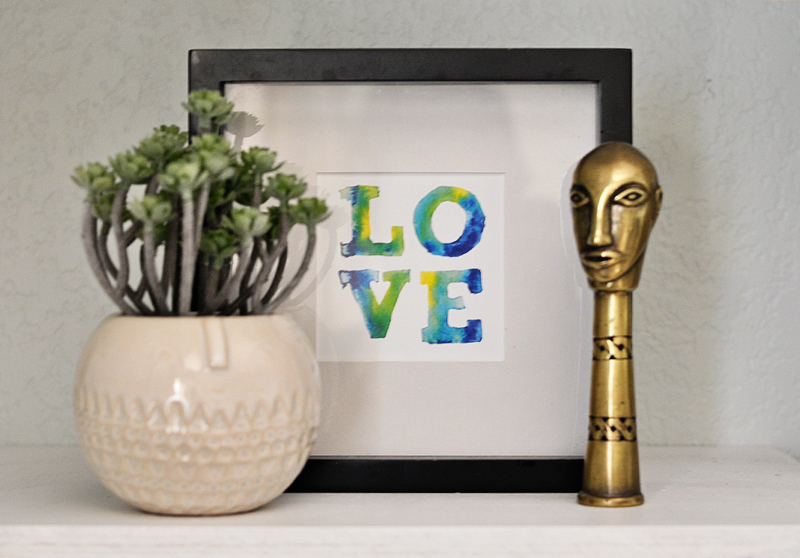 Marriage Month: Combining Two Decorating Styles - Real life, on purpose. 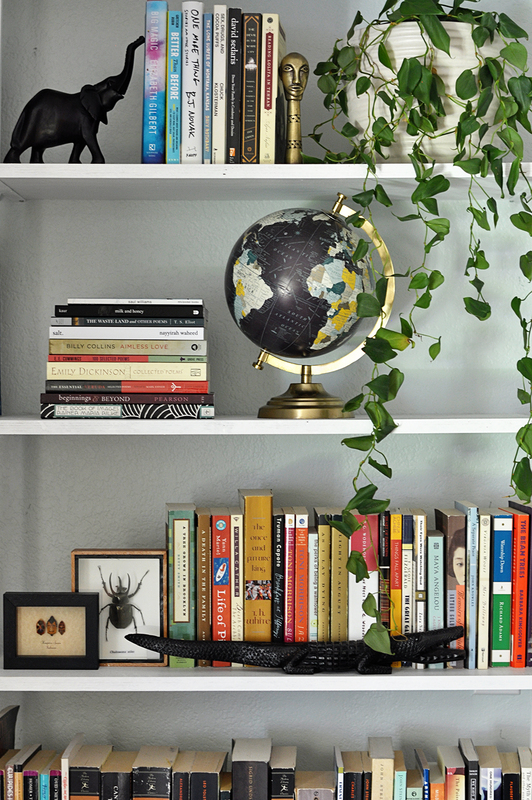 There are dozens–if not hundreds–of tutorials on how to style a bookshelf. Quizzes on how to identify your design aesthetic. Articles full of (mostly arbitrary) dos and don’ts of decorating. Since I have zero credibility in that arena, I’ll let people like Emily Henderson give you far better advice than I ever could. When I talk about combining two decorating styles, you should know I’m coming at it from a slightly different angle. This is marriage month, after all. Instead of specific styling tips, I want to share a few overarching principles that we use when decorating our home. I won’t pretend they’ll help you design a magazine-worthy space. They may, however, help you make some decor decisions that make your home a better reflection of the two of you. 1. Ask for, listen to, and respect your spouse’s opinions. This is sound advice for so many aspects of marriage, but I think a lot of couples ignore it when it comes to combining two decorating styles. One person makes all the decisions and the other tolerates it. My point is, you’ll never know if you don’t ask and listen. Try to make decisions as a team. Sometimes one of you gets to make the final call. Sometimes you compromise. But if you’re going to share a space, you want it to be a space in which you both feel happy. 2. Take care of your space. If I didn’t feel so strongly about #1, then I’d have put this first. The most beautiful home is one that is loved. Not the most flawlessly decorated, or expensively furnished, or immaculately clean. Just loved. And when you love something, you treat it with care. So take care of each other’s stuff. Don’t clean only your own things and ignore theirs. 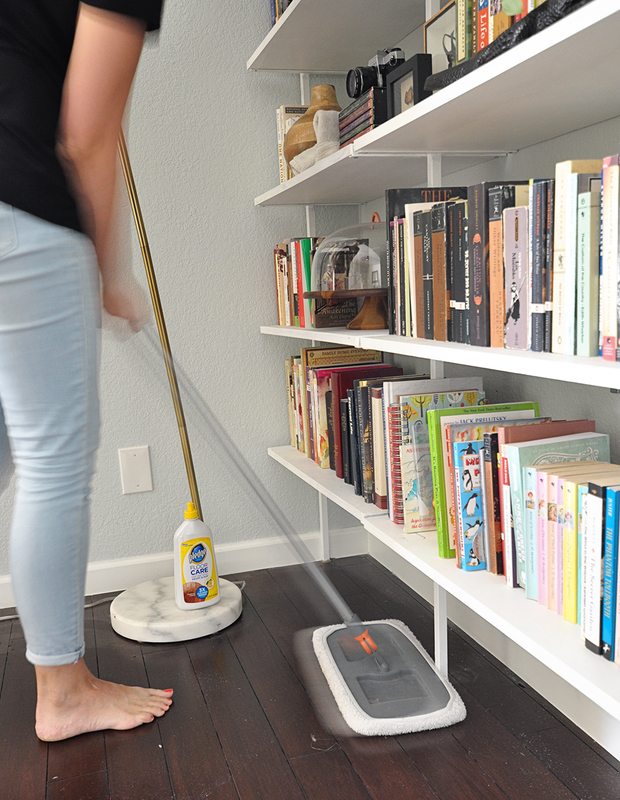 Don’t make their things “magically disappear.” Don’t push things under the bed to gather dust. It’s about showing respect: respect for your home, for your possessions, and for each other. If you’re lazy like me, you get one product (instead of like seventeen) to do all the dirty work for you. 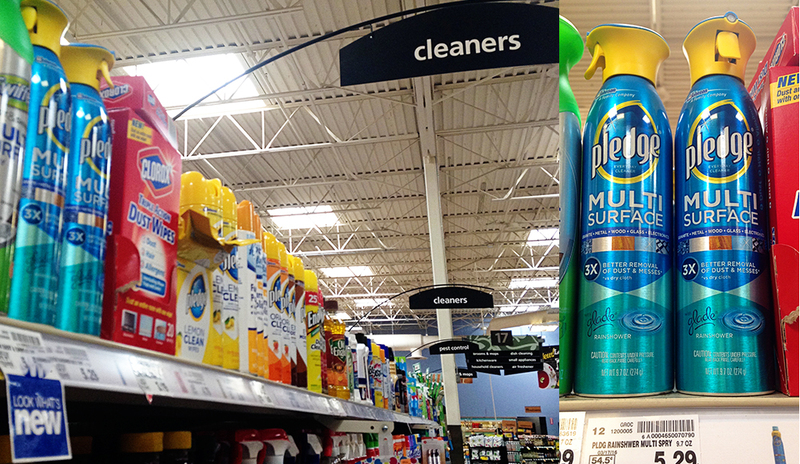 I have been buying Pledge® Multi Surface Everyday Cleaner with Glade® Rainshower® when I get my groceries at Fry’s for literally years. I use it on pretty much our entire house. It’s awesome! Everything in this corner, from the marble-based brass floor lamp to the ebony elephant figurine, gets a quick spray and polish and I’m done. Even that big red and blue basket gets an occasional once-over; I spray Pledge® Multi Surface Everyday Cleaner on a clean washrag, wipe it down, and it’s dust free. 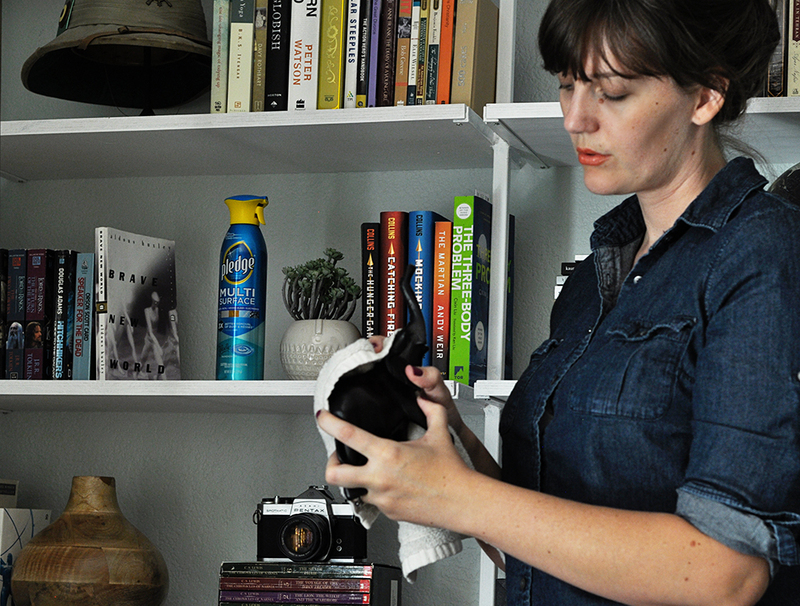 Same for our leather-framed mirror, my ceramic jewelry stand, these steel brackets and painted wood shelves…I’m not joking when I say it safely cleans just about anything. 3. Decorate with things that each of you loves. David probably could care less about my cake plates or ever-growing library…but I love them. I have mixed feelings about that humongous basket…but it’s special to him. Our entire house is a blend of my quirky art and his East African artifacts, not to mention travel souvenirs we’ve picked up on our individual adventures. 4. Decorate with things that both of you love. For larger pieces, this is especially important. Nobody wants to hate the sofa they sit on every single day, and nobody wants to resent their spouse for forcing them to buy that hated sofa. For David and I, that means we have to agree on big purchases. At the very least, one of us finds something and says, “I like this,” and the other says, “so do I.” So, we get it. Smaller items are important too. When I brought the little globe home, I knew David would love it before he said anything. The giant beetles in shadowboxes were a Christmas gift to both of us, and they’re creepy and awesome and we both dig ’em. We may not always see eye to eye on the rest of it, though, and that’s okay. However things come into our home, just like our relationship, it’s a little of his, a little of mine, and plenty of ours. 5. Don’t be afraid to mix + match materials, eras, textures, sizes, colors, etc. Have you ever been to a house that feels too pristine? Not that it’s too clean (that’s hardly a bad thing!) but too put-together? Like it’s not really lived-in? That’s what happens when you replicate what you see in catalogs or the Ikea showroom. If I’ve learned anything from reading home decor blogs, it’s that matchy-matchy is OUT. Eclectic is IN. Layered is GOOD. 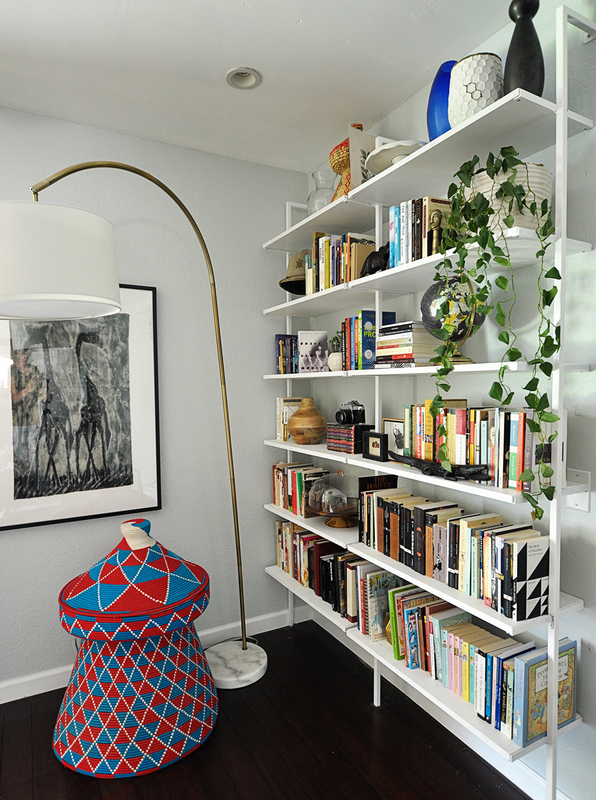 This may happen naturally, simply because you’re already combining two decorating styles. However, I know a lot of people feel like they need to stick to a single aesthetic or even “theme.” False. A little modern + a little vintage? Something masculine + something feminine? Metal + wood + paper + greenery + ceramic + woven textiles + plastic + whatever else? Trust me, guys. It works. 6. Use items in matching and non-matching pairs. This tip is probably exclusive to shared bedrooms, but it’s worth mentioning. We will eventually have identical side tables and sconces* to make our bedroom feel cohesive. In the image below, though, you can see a handful of non-identical “twins.” The shape and size of my cake dome and his pith helmet are very similar, for example. We’ve got two little faces on our shelves: the brass head is his and the ceramic planter is mine. Decorating in pairs is an easy way to denote “yours + mine” when you’re combining two decorating styles. They don’t need to be next to each other, either, or even “mirroring” each other from across the room. Except for maybe those side tables and sconces. I feel like symmetry makes the most sense in that case. But otherwise, find a spot that makes you happy and a pox on the rules! 7. Remember: it’s not a competition. Sure, she picked out all the lamps and chose where to put the console table, but that doesn’t entitle you to throw away that painting you don’t like. When you start keeping score in any aspect of a marriage, including home decor, you’re no longer on the same team. If you feel left out or overwhelmed by the other person’s style choices, please see #1 above. Communication is so important, y’all. Amen and amen. Remember how I attempted to redo our master bedroom like four months ago? I repainted, David built these shelves, and then I kind of left you hanging? Well, consider this an update….of this one corner, anyway. The room still has a ways to go before it’s finished. For one, that basket isn’t exactly the cozy chair I’d envisioned for my reading nook. David decided he wants to make a chair instead, so I’ve stopped window shopping for the perfect one. The basket’s merely a placeholder until then. It needed a home anyway. He also still plans to make us a bed frame/headboard. Since he’s been swamped with other stuff and it’s been a bajillion degrees outside, that’s been put on hold as well. The dresser got new drawer pulls, we hung a new mirror over it, and our new rug and bedding have gotten plenty of use. Those back-ordered sconces finally showed up and they’re PERFECT. Have I hung them? Nope. Waiting on the headboard so I know at what height to put them. That said, I’m beyond pleased with this small amount of progress. It sounds super corny, but we’ve spent so many evenings gazing at these shelves from our bed, talking about and admiring the things on them. We’re working together to create something we are both happy with. Which is kind of what marriage is all about, don’t you think? Big thanks to Pledge® for taking care of and protecting all the little things that make our house beautiful! You can learn more about how Pledge® celebrates the beauty of homes on their Facebook page, or go here to find out how Pledge® products can help make your home a reflection of you. Does your spouse have any interest in home decor? I’m always surprised by the things David has strong opinions about, but I sure love discussing and making decisions together. What about you? 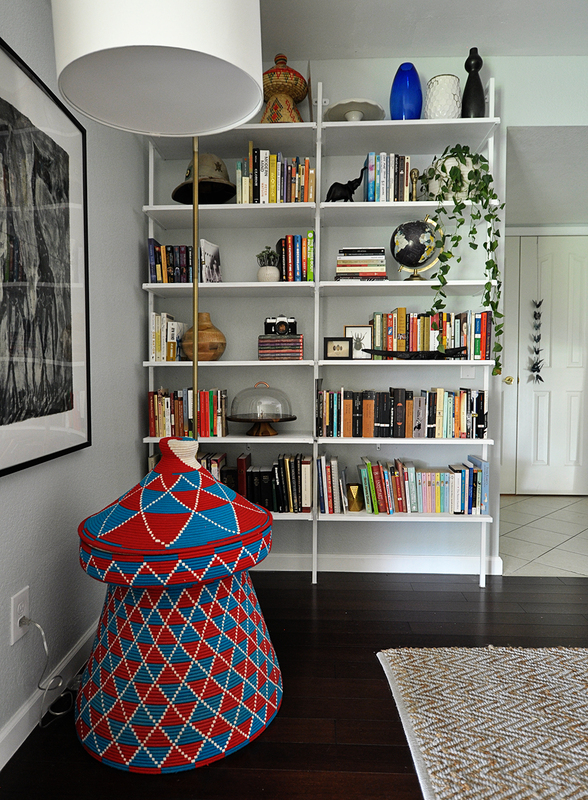 How do you decide how to decorate your shared spaces? Thanks! I sure like having a husband who can build just about anything I can dream up! I love love LOVE looking at people’s bookshelves!! !